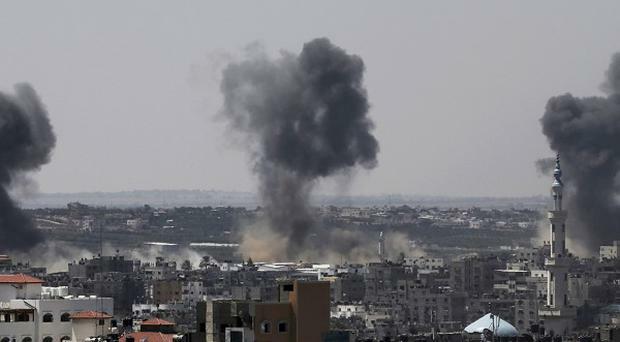 Israel's bombardment of the Gaza Strip in retaliation for militant rocket attacks on its territory amounts to a "deliberately disproportionate form of collective punishment", Deputy Prime Minister Nick Clegg has said. Mr Clegg urged the Israeli government to stop military strikes on the densely-populated Palestinian enclave, where officials say the death toll from the 10-day battle has reached 222, with 1,670 injured. One Israeli civilian has also died in the conflict. Israel and Gaza's Hamas leadership have agreed a five-hour United Nations-brokered humanitarian pause in the fighting, which began at 10am local time (8am UK time) to allow Palestinian families to restock on food, water and other necessities. Speaking on LBC radio, Mr Clegg urged both sides to build on the ceasefire to prevent further deaths and a continuation of what he described as "unimaginable human suffering" in Gaza. Prime Minister David Cameron has not condemned Israel's military action, while his official spokesman has said that the key to resolving the conflict is for Hamas to stop firing rockets into Israel. Mr Cameron signed up to a European Union statement last night which called on both sides to "de-escalate the situation, to end the violence, to end the suffering of the civilian populations notably by allowing access to humanitarian assistance, and return to calm". The EU "deeply deplores the loss of innocent lives and the high number of wounded civilians in the Gaza Strip as a result of Israeli military operations and is deeply concerned about the rapid and dramatic deterioration of the humanitarian situation," the statement said. But the Deputy Prime Minister went much further by saying: "I have to say now that the Israeli response appears to be deliberately disproportionate. It is amounting now to a disproportionate form of collective punishment. It is leading to a humanitarian crisis in Gaza which is just unacceptable. "I would really now call on the Israeli government to stop. They have made their point." Mr Clegg added: "Regardless of which side you are on in this ancient bloody conflict, no-one can feel indifferent to the spectacle of this overcrowded, desperate sliver of land in Gaza, where so many thousands of people are suffering. "I will always defend Israel's right to respond and to defend itself in the face of violence that aims to terrorise Israeli citizens. I have spoken out repeatedly about Israel's very legitimate demands that Hamas and others recognise Israel's right to exist, and to exist peacefully within its own borders and provide security to its own citizens." He said: "It is not in the long run in Israel's own interest to see this festering humanitarian crisis get ever worse in Gaza because all it does in the long run is incubate the next generation of violent terrorists who want to harm Israel. "Today we have a glimmer of hope that a five-hour ceasefire has been entered into by both sides and my plea to both sides is please build on that because further deaths and more violence begetting more violence is not in anybody's interests and is not going to help deliver the only way in which Israelis are going to be able to live in peace in the long run, which is a negotiated two-state peace settlement."